Jon H. Swenson, M.D, F.A.A.O.S. 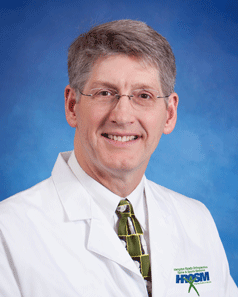 Dr. Jon Swenson has been practicing orthopaedic surgery on the Peninsula since 1991. He was born in Davenport, Iowa, and raised outside of Memphis, Tennessee. He graduated with honors from the University of Memphis, with a Bachelor of Science in Mechanical Engineering. He went to the University of Memphis on a full academic scholarship. He was the president of Tau Beta Pi, the national engineering honor society, and a member of The Golden Key Honor Society. He received his medical degree from the University of Texas Medical Branch, in Galveston, Texas. He completed his general surgical training at St. John Hospital in Detroit, Michigan and then went on to orthopaedic surgery training at the world renowned Campbell Clinic in Memphis, Tennessee. Dr. Swenson performs surgery at Mary Immaculate Hospital. He has been recognized in the Hampton Roads Magazine in the Top Doctors Hall of Fame 2005-2009, 2013, 2016 and 2017. Dr. Swenson has been recognized nationally as one of “America’s Top Orthopedists” in 2007 by the Consumers Research Council of America. He was also listed in the Guide to America’s Top Surgeons, 6th Edition-2006. Dr. Swenson received the “Top Doc” Award from Coastal Virginia Magazine in 2018. Dr. Swenson is a past president of the Newport News Medical Sociey-2000. He received the Three Year American Medical Association Physician’s Recognition Award for 1991-1994. He is Board Certified in orthopaedic surgery. He is a member of the American Academy of Orthopaedic Surgeons, the Newport News Medical Society, the Medical Society of Virginia, and the Virginia Orthopaedic Society. Dr. Swenson specializes in sports medicine, arthroscopic surgery, and minimally invasive joint replacement surgery of the shoulder, knee and hip. Dr. Swenson travels the country to instruct other orthopaedic surgeons in joint replacement techniques – especially the tissue sparing anterior approach total hip replacement. He lives in York County, he is married to Christina Swenson M.D., and they have three children: Nicholas, Eric, and Hannah. He enjoys golfing, wake boarding, water skiing, and fishing.